College students are some of the busiest people there are, and we can all agree from first hand experience. Our schedules are packed with classes, assignments, studying, club meetings and sometimes work. Most of us have been #blessed to have a car to take us to and from our appointments, but how often do we show our vehicle any love? Our cars battle the harshness of the beachy weather and trek so many miles, but some of us are too busy to show our vehicles any appreciation. One way we can show our vehicles appreciation would be to bring it into the shop to get a regular checkup, but that would just require another addition to our schedule. Another more convenient way would just simply be washing our cars. You could take your car to those easy $7 car washes connected to your local gas station, but your car comes out with water spots that render the whole wash pointless. You could also wash it yourself, but you either need a front yard or a bunch of quarters just for 15 minutes of water from those self service car washes. These are tempting options, but when you’re pressed on time and want a clean car, taking it to a hand car wash is the best bet. Hand car wash places take the time to hand wash and dry your car, along with polishing and vacuuming the interior of your car. In a sense, they show your car care that you would have if you had either a front yard to wash your own car or quarters you can spend on something other than laundry. These locations are extremely convenient, but--being a college student--money is also something we are reluctant to spend frivolously. There are a number of places in Long Beach that keep the humble college student in mind, and this list will determine the best place where college students can get the most bang for their buck. A usual sight for CSULB commuters, Coast Hand Car Wash boasts the closest distance to campus for students. With four television monitors in the waiting area including a monitor that focuses on your car going through the wash, the multitude of snacks and refreshments inside the convenience store, and a location centered in an area of heavy traffic, it is certain that this place gets a lot of business. A lot of investment went into this place: the building seemed like it was just put through a remodeling and the interior was adorned with visually appealing decor. However, the pricing was a bit on the expensive side. For a full service wash--which includes vacuuming, window cleaning, doors and console wiping, and chemical tire cleaning--was $17.99. There are other packages; such as the VIP, the Executive, the Presidential, and the Royal, all in which range in price from $22.99-39.99. If you were looking for something a bit more special, they also have Custom off-line hand washes for $35 for cars and $45 for SUVs. Fortunately, there is an incentive for us college students, in which presenting your school ID can get you $2 off your entire purchase. This is a smart move, considering they are located about a stone's throw from campus. Overall, this place is one of many other hand car wash locations in Long Beach that is worth considering. Give your car that old-school experience and treat it to a detailed car wash at this locale. Circle Marina almost feels like a time machine. The building has a 1950s theme going about it, despite the fact that this car wash has only been around since 1990. And it doesn’t look like much has been done to the place since then: there are old car event posters displayed all around the store and it seems like they have been trying to sell the same merchandise inside the store since they opened. But this is no big deal to them, because this place gets so much business that it would be no problem if that merchandise continued to stay on those shelves. The pricing for this place is not far off from the location previously mentioned, if not just a tad bit less expensive. It’s $16.99 for a basic car wash which includes vacuuming, window cleaning, interior wiping and tire dressing, but if you want more, there’s the glass finishing for $22.99, the crystal finishing for $24.99, and the Diamond finishing for $27.99. There is no waiting area inside the store, but there is a nice shaded area just outside the store. If you feel like grabbing a quick bite while your car is getting cleaned, there are food places within walking distance, and the workers do not mind parking your car until you return for your car. This place is on this list because of the stellar job they always do, the incentives of getting a free wash after a certain amount of times, and the 20% off student discount. This place is just a little bit farther from campus, but it is worth the extra five minutes of driving. No need to break the bank here. Get your car treated just right to the most affordable option here in Long Beach. This place just barely makes this list due to it having the cheapest basic wash service of only $14. Though there is a catch: this service only cleans the exterior of your car. If you’re looking for something similar to the previous two, you’re looking at paying $18 for Wash #1: 100% hand wash which includes vacuuming, window cleaning, tire shine, interior dressing, and fragrance. Other washes are priced at $23 for wash #1 plus, $24 for the Luxury wash, and $35 for the Super wash. This place can turn out to be the most expensive of the three, and the fact that there is no student discount offered is making this place seem less interesting. However, this place does a fairly great job on cleaning your car. They hand wash every car, so there is no need to worry about your car going through a machine and it leaving any swirl marks in your car’s paint. This place may be a bit more expensive, but when you take into account that these workers are actually putting their effort into washing these cars, it makes it easier to see where your money is going. Finding a reliable car wash place can be tricky; most places are either self-service car washes or they are connected to a gas station in which your car never gets completely clean. Some hand car wash locations can also be unreliable in which you would deal with either an unreliable job or rude workers expecting you to tip them for an overpriced service. 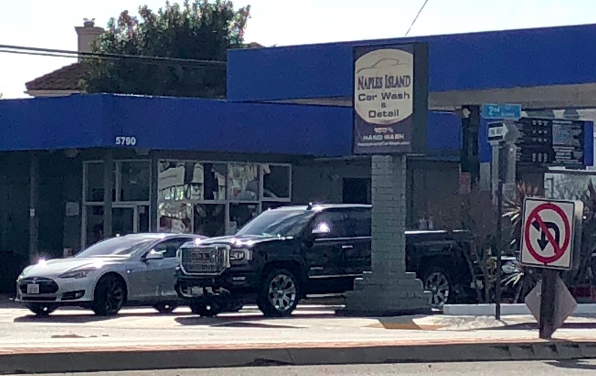 These three places surpassed my expectations in getting a detailed car wash for a reasonable price and made me consider on returning. So next time your car is dirty from that busy schedule of yours, don’t forget to show your car some love, it’ll thank you for it.